Q: How many people can you fit in a kayak? If you said one or two, then you’re not trying hard enough. We just watched a 1922 documentary about an Inuit man who was able to transport himself, his wife, two pre-adolescent children, a baby and a puppy in a kayak. Yes, in one kayak. Perhaps you’ve heard of this man. His name was Allakariallak, but he’s more famously known as Nanook – as in, Of The North. 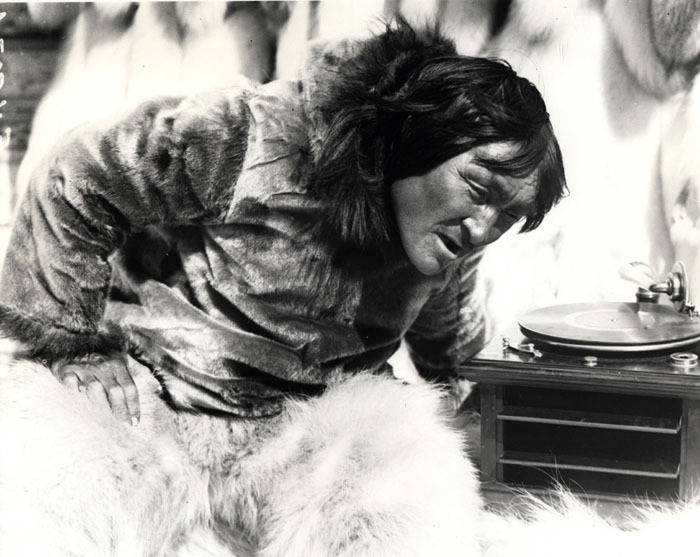 Nanook of the North is considered to be the first feature-length documentary. It focuses on an Inuit man and his family who lived in the Canadian arctic. This photogenic family allowed a crew to film them while they lived their everyday lives – caring for their children and hunting down food. Director Robert J. Flaherty, who spent months in the harsh arctic climate, has given us a fascinating account of life in the far north. We, as an audience, watch the film slack-jawed and bug-eyed, amazed that people could live – no, thrive – in this environment. These remarkable people endure subzero temperatures for months at a time; they walk for miles to find food; and they always seem to know exactly where they are, even though the landscape all looks the same to us. And get this! Nanook can build an igloo, complete with an ice-pane window, in an hour! An hour! Nevertheless, the footage is still riveting. You start to wonder about the film crew themselves. What kinds of problems did the cold weather cause the primitive cameras? And how many times did the glare from the ice wreck once-in-a-lifetime shots? Then there’s Nanook himself, who became a global celebrity in the 1920s. He is as compelling a character as any on screen. But, sadly, it wasn’t enough to save his life. Within two years of filming, Nanook was dead. The film says he died of starvation but he may, in fact, have died of tuberculosis. Regardless, it’s a bit eerie to watch a healthy, vigorous Nanook on the screen with the knowledge that time for him was to be soon cut short. If you want to immerse yourself in a world that is completely different than our own, or if you have an interest in documentaries, we recommend Nanook of the North. We feel it is a film you ought to see at least once. Nanook of the North: featuring Nanook, Nyla, Allee. Directed by Robert Flaherty. Revillon Frères, B&W, 1922, 78 mins. I do need to see this. Interesting! I never knew of this 1922 movie and it sounds fascinating, thank you. This really is an interesting film. You almost can’t believe anyone could survive in that environment. You are something else. Now I want to see Nanook of the North! The heck?!? Ha – Karen, you really are the best. “Nanook of the North” may not be a film you’d watch annually, but it makes you glad you’ve seen it. I’ve heard about this film for years, but was never really interested… until now. What an undertaking this must have been for everyone involved. I suppose I’ll have to bundle up and watch this one soon. Yup, make sure you’ve got a big sweater on when you watch this! There’s one scene where Flaherty talks about the frigid weather and how it goes on for “days and days and days”. To his credit, this is the most he complains about the bitter cold. Yes, some of the scenes are obviously staged, but still an interesting film nonetheless. The kayak! I know, right? I was dumbfounded when more and more people climbed out of it. I would never have thought it possible. Hey Dor! Absolutely – it is the audiences’ feelings about a movie that count, and audiences certainly warmed to the charismatic Nanook. I’ve never heard of Top Cat. I did an online search, and it looks like he was pretty popular back in the day. There are even tributes to him on YouTube! Nanook of the North is amazing, and the work that went into this “documentary” is worthy of its own documentary. I’m not familiar with all the events surround this movie but from what I do know, it would make a VERY interesting documentary. very interesting, never seen it even though I’ve referenced it so many times and as you say, the concept is very much a part of our everyday life, ha. the other thing is how early in film “reality” was already being manipulated for entertainment. sometimes you think that’s just a modern phenomenon, but no. thanks! I read your reply to Sarah and that was how it was when I grew up. Someone bundled up for the coldest of days was “Nanook of the North.” I”d no idea that the appellation was based upon a documentary, and such an important one, at that. Thanks for the heads-up. I really do want to find a copy and watch this. All the controversy notwithstanding, it really is an important documentary. Plus, Nanook is a fascinating character – you realize how smart he is, to overcome his environment at every turn. Oh, this is one of those film I know I should see, but somehow.. and now you tell me that they eat raw walrus flesh? Any chance Cary Grant makes an appearance? Ha! A Cary Grant appearance would have been lovely. About the walrus flesh… I watched this doc while eating breakfast, something which I do not advise. I am a Florida girl (currently living in the mountain West). I hate snow, and I can barely tolerate temps below 60 degrees. I am always amazed that people actually love Arctic climates. Knowing my son’s sense of humor, if we watched Nanook, he would turn the thermostat down as low as it could go…just to give us a little taste of the Arctic. I don’t have a problem with some of the footage being staged…provided it was an accurate depiction of an act he would have done. It definitely sounds like an interesting piece. Oh boy. If you’re a Florida girl who loves warm temperatures, then you made a great sacrifice indeed to live in the mountain west. Hats off to you, Patti! I love that you reviewed this film! It seems like all celebrated documentaries sport a controversy or two and NANOOK is no exception. 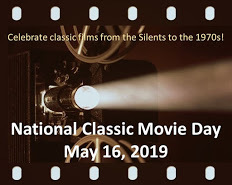 Still, it was a landmark in documentary films and has become a staple in introductory film classes. I’m glad to hear this film is a staple in introductory film classes. It deserves to be! Staged scenes or no staged scenes, it’s a fascinating film about a remarkable family. I had heard the expression “Nanook of the North” when someone is dressed in warm layers, but had no idea where it came from. This sounds so interesting. I agree with Patti that I don’t mind the staging as long as it is based on something he really does. As a person who does not like to be cold, it would probably be painful to watch, but fascinating. I am going to see if I can find this one. Thanks, Ruth!